Government Job: Border Security Force has issued an application on the strength of the Constable. The total number of posts issued in BSF Recruitment 2019 is 1763. In order to apply for these posts, candidates must have ITI in the relevant trade along with 10th. Border Security Force Recruitment In 2018 the applicants age 18 years and maximum of 25 years have been fixed for applying to the posts of constables. To apply for the posts of constable in the Border Security Force, look at the official release issued by the BSF and the application process based on the guidelines given therein. Click here for more information related to government jobs. Please tell that the candidate should have IIT and other academic qualifications with 10th from any accredited institution / board. The minimum age of candidates for the posts is fixed at 18 years and maximum 23 years. 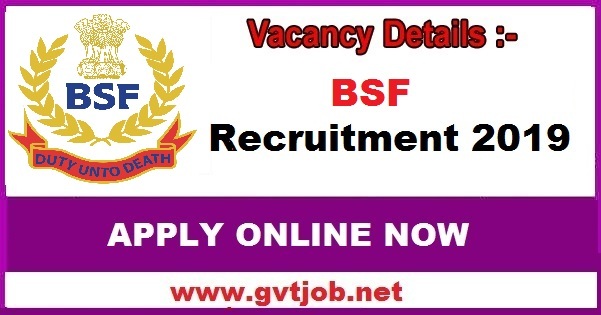 Interested candidates can apply online through the website www.bsf.nic.in till 03 March 2019. Selection Process: Selection will be based on written examination, physical test and medical test. See advertisements for information related to Border Security Force.